French fashion designer Thierry Mugler presented on Tuesday at the Montreal Museum of Fine Arts the first ever retrospective of his 35-year career, including outfits and sketches. "The thing that touches me most, when I see all these pieces, is the fact that I motivated and gathered around me exceptional masters," said Mugler, 70. He described the show as a "glamorous tragedy." 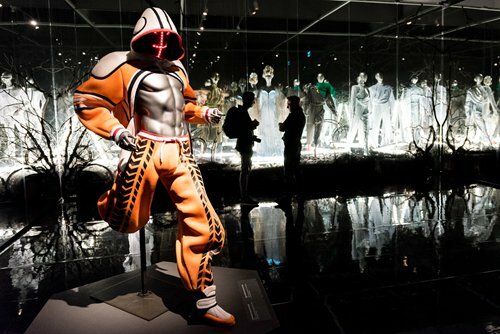 Thierry Mugler: Couturissime brings together dozens of objects from the couturier's career: outfits, costumes but also sketches, photographs and videos tracing his success from 1977 to 2014. Organized into acts, "like an opera," according to museum director Nathalie Bondil, the exhibit also features animated screenings and music to create thematic ambiances embodying the designer's various projects over the course of his career. "Mr Mugler is a legend, an icon, the qualifiers are many because his work is quite exceptional," Bondil said. The exhibition will be open to the public from March 2 to September 8.